October, 10th 2018, an open doctoral promotion exam was held on Dr Dewi Kusuma Wardani, M.Sc by the Master of Science and Doctorate (MD) Program of FEB UGM. Dr Dewi Kusuma Wardani, M.Sc is one of the MD FEB-UGM accounting doctoral students who also works as a lecturer at Sarjanawiyata Tamansiswa University, Yogyakarta. 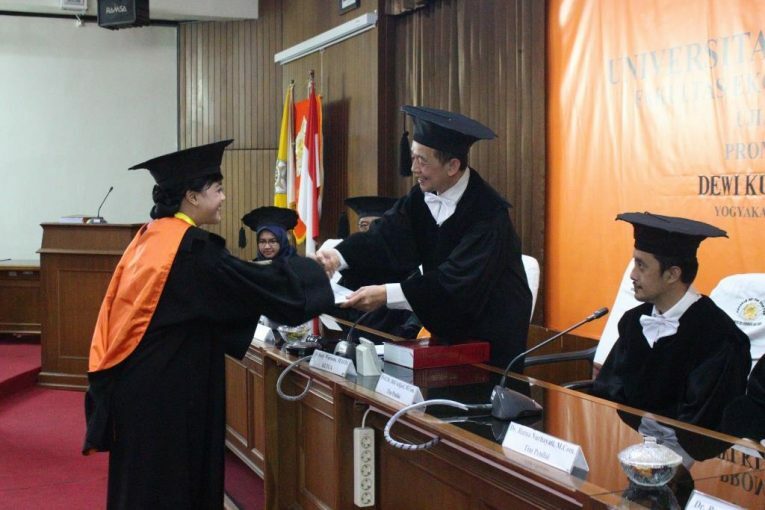 The dissertation entitled “The Effect of Tax Avoidance Trends on Risk with Corporate Governance & Financial Constraints as Moderating” brought Dr Dewi Kusuma Wardani, M.Sc. won the title of Very Satisfactory at the doctoral promotion open examination this time, and was the 257th doctor who graduated at FEB UGM and the 4th doctoral doctorate who graduated at Gadjah Mada University. The study of Dr Dewi Kusuma Wardani, M.Sc aims to investigate the effect of tax avoidance trends on corporate risk and conditions that can moderate the relationship. The two proposed moderation variables, namely corporate governance, are expected to weaken the positive influence of tax avoidance trends on company risk, while financial constraints reinforce these positive influences. The results of the study confirm the role of each of these moderating variables. Theoretically, this study confirms agency theory, where there is a conflict of interest between stakeholders in the company. Meanwhile, company management sided with one of the parties to secure themselves.